A recent study by Dr. Magda Havas et al. sharply contradicts accepted studies on electrohypersensitivy (EHS). This study purports to show that the heart rate of electrosensitive subjects is subject to dramatic increases in the presence of EMF from a cordless phone (see Provocation study using heart rate variability). On her web site, Havas states that this study was published "in the peer-reviewed European Journal of Oncology Library Vol. 5 2010". Upon investigation it turns out that this impressive sounding journal is actually an internal publication of the Ramazzini Institute. This organization is the source of discredited claims that the artificial sweetener aspartame is a dangerous carcinogen. These studies have been widely criticized for serious flaws in methodology in the scientific community, and are not accepted. Not all scientific journals are of equal weight. In fact this journal has one of the lowest scores in the rankings of scientific journals. The European Journal of Oncology has been cited only 5 times in the past 3 years, as compared with the respected European Journal of Cancer, which has been cited 4,743 times. Not all scientific journals are of equal weight. However, the new Havas study needs to be evaluated on its own merits, not on where it was published. The authors of the new Havas paper claim that this is the first double blind study that demonstrates a "real" electrosensitive effect. This single study is in sharp contradiction with dozens of other rigorous studies such as the systematic review paper by Rubin et al. The Havas study is highly questionable due to this fact alone. However, our group has identified a number of potential flaws with this study such as electrical interference within the equipment and improper blinding. The heart of the Havas paper (no pun intended) consists of several charts such as the one below which is a plot of heart rate over four consecutive 3 minute intervals. A Nerve Express heart rate monitor based on electronics made by Polar was used by Havas to produce these charts A cordless phone was turned on and off at three minute intervals. 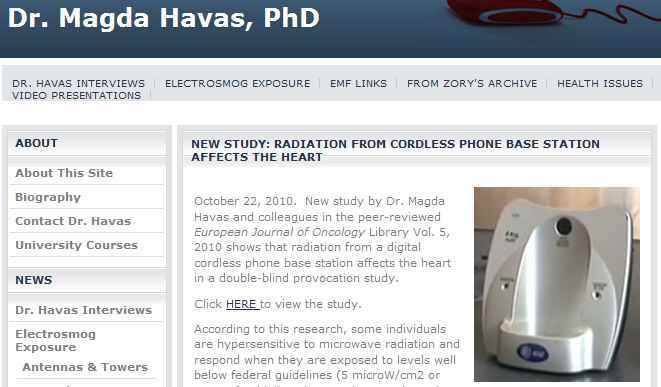 The Havas paper claims that the heart rate of electrosensitive subjects speeded up or started to race when the cordless phone was on. We will evaluate three different hypotheses to explain these dramatic results. Hypothesis 2: The experiment was not properly blinded, and electrosensitive subjects had a psychosomatic panic attack when they believed the cordless phone was on. The Nerve Express device uses computer processing to calculate and display the heart rate. The vertical axis is "R-R Interval" which is the interval between heart beats measured in seconds. So a pulse rate of 60 gives an R-R interval of 1 second. A pulse rate of 120 gives an R-R interval of 0.5 seconds. The horizontal axis is time. Havas has time markers at 8:09:04 PM, 8:12:00 PM, and 8:14:44 PM. These are at approximately 3 minute intervals, which correspond to 3 minute on/off cycles of the cordless phone. This is a real electrocardiogram. The raw electrical signal from the electrodes attached to the patient's chest is plotted directly. No computer processing is used. Any artifacts would be readily apparent. This is what professional cardiologists use to monitor heart rate and to diagnose heart conditions. Given the rather brief description of the experimental set-top in the Havas paper, there are many ways in which the "double blinding" could be imperfect. The cordless phone shown on Havas web site has at least two LED's which light up when the power is on. Either the subject and/or the experimenter might be able to see this, which would defeat blinding. The cordless phone was manually connected by the experimenter to either a live or a dead power outlet (unlabeled) every 3 minutes. This was the method used to randomize the on/off cycles. Any number of cues could have been picked up by the experimenter so he would "know" which was which. This would also defeat blinding. These are some of the many ways that experimental protocol may have been improperly blinded. However, the heart rate charts themselves raise serious questions. Havas used a heart rate monitoring device made by Nerve Express. This device is not a real electrocardiogram (ECG) of the type used by cardiologists. A real ECG is shown in the 2nd image. The Nerve Express device uses computer processing of the ECG signal in order to calculate and display the heart rate. This computer processing is prone to error. Looking closely at the Nerve Express chart, there are a lot of "spikes" in the intervals with high heart rate when the cordless phone is "on". It is hard to believe that this data is real based on straightforward physiological considerations. It is plausible for heart rate to suddenly race - for example if someone panics (fight or flight reflex). But it is implausible for heart rate to suddenly slow down. Once the heart is racing, whether due to physical exertion or adrenalin, it takes time for it to settle down. This chart if full of sudden jumps in heart rate, but it also contains sudden multiple decreases in heart rate. It is highly implausible that a person's heart rate could suddenly race multiple times in a 3 minute interval, and it is especially implausible that the same heart rate could suddenly slow down. Furthermore, the person being tested would surely notice that their heart was racing. Such a fast heart rate indicates a state of panic. The experimenter should have verified such a dramatic change by taking the person's pulse either manually or with a stethoscope. There is no mention of this in the paper. These points seem obvious, even to a layman. We confirmed the physiological implausibility of the "spikes" and sudden decreases in heart rate with a cardiologist. We also contacted the manufacturer (Nerve Express) of the heart rate monitor who confirmed that the chart is full of artifacts that cannot be real. A real electrocardiogram should have been used to verify the "results" of the Nerve Express device. The use of an error prone amateur heart rate monitor undermines the credibility of this study. The claim that this paper was "peer-reviewed" is perhaps an indication of the extremely poor quality of this journal - which has a near zero ranking. For this reason, our conclusion is that hypothesis 1 is implausible. The heart sensing belt used with the Nerve Express device is worn around the chest. Unlike a professional electrocardiogram, the sensor electrodes are not glued to the subject's body with adhesive tape. The sensor electrodes can shift if a subject changes his breathing pattern, moves, or fidgets. Experimentation with similar sensors by the same manufacturer has shown that "noise" spikes of the type seen in the Nerve Express chart from the Havas paper are easily induced by slight body movements. As a result, heart rate readings from this device are highly unreliable. A nervous test subject might react to cues from the experimenter such as plugging and unplugging the cordless phone power adapter. Such reactions would be recorded as the kind of spikes seen in this chart. The heart rate monitor used in this study was not a professional device. The experiment should have been done with a professional electrocardiogram (ECG) that is not sensitive to body movements. A professional ECG is a definitive device for measuring heart rate. Any artifacts will be immediately detected by a professional cardiologist. Hypothesis 2 due to improper blinding is a plausible explanation for the results. Let's consider the issue of potential electrical interference within the equipment used in the study. The study used heart rate monitoring software made by Nerve Express, which uses a heart rate sensor manufactured by Polar. In their instruction manuals both companies include warnings about the possibility that electrical interference from devices such as a cordless phone may interfere with the heart rate readings. The Nerve Express manual includes the following warnings. There are many factors that can lead to erroneous heart rate readings due to the extremely weak electrical signals from the body that are used with this technique for heart rate measurements. Thought Technology sells heart rate monitoring devices that use a similar "electrode to the skin" method for measuring heart rate. The following warnings (courtesy of Thought Technology) about the sensitivity of heart rate measurements (see document HRVThoughtTechnology.pdf) also apply to the Nerve Express/Polar equipment. "The EKG signal is measured in microvolts (1 μV = one millionth of a Volt), which means it is a fairly small signal. Because artifact can be many times larger than the actual signal, some care has to be taken to minimize all possible sources of signal distortion. This is often illustrated with the GIGO principle: Garbage in, garbage out. If the raw signal you are recording contains too much artifact, the IBI (inter beat interval) output will be wrong and the analysis that can be generated from it will probably be bad as well." When processing signals for HRV analysis, two kinds of artifacts can occur: Missed beats and Extra beats. Both types are most often caused by signal distortion. A missed beat, for example, can occur when the signal is so distorted that the software is unable to identify the beat pattern and only picks up on the next good beat. The end result is an artificially long IBI value. An extra beat, on the other hand, occurs when the program confuses a distortion in the signal for a beat and "sees" two beats, or more, when there should be only one. Extra beats cause the appearance of abnormally short IBI values. Both types of artifacts are easily seen on a graph which plots the IBI values over time as sudden very high rises or very low drops". The Infiniti encoder and the EKG sensor are capable of detecting very tiny electrical signals (millionths of a Volt) generated by the human body. Therefore the system is very sensitive to electromagnetic fields generated by other devices in the room or nearby, such as radio transmitting devices, computer monitors, medical devices (for example x-ray machines) and fluorescent lights. It is a good idea to turn such devices off if they are not needed during the session. It is also recommended to make sure that your biofeedback instrumentation is kept at least 10 feet away from any radio transmitting devices and 3 feet away from electronic devices (including monitors) and fluorescent, halogen or neon lights. The experimental setup in the Havas study completely ignored all these warning about electrical interference producing artifacts in the heart rate measurements. This includes the specific warning about keeping "transmitting devices" at least 10 feet away, and especially the warning that "artifacts are easily seen on a graph which plots the IBI values over time as sudden very high rises or very low drops". This is precisely what is seen in the Havas charts!! The cordless phone base unit - which is a transmitting device - was located only 30 - 50 cm (1 - 2 ft) from the sensitive Nerve Express/Polar equipment. All this strongly suggests that simple electrical interference was responsible for the sudden changes in heart rate "measurement". This type of electrical interference is highly sensitive to the relative placement of the various pieces of equipment including the Nerve Express/Polar chest sensor and receiver, the wiring to the computer, the location of the cordless phone, and the subject. It would not be unusual for such interference to be erratic and intermittent due to the manner in which the computer attempts to extract the heart rate from the noisy signal. This would explain why high pulse rates were not detected with all subjects. It is also consistent with the fact that 3 out of the 4 "intense" subjects were consecutive (they were the last subjects). The equipment placement is likely to have been constant for these three subjects in a row. Movement by the subject such as changes in breathing pattern, and slight body movements can also induce artifacts in the measurements. One of us (Harvey Kofsky) tested a Polar heart rate monitor (Polar S510/520) similar to the one used in the Havas study. The "measured" heart rate jumped to over 200 beats per minute when the unit was in close proximity to a laptop computer. This is a clear and direct demonstration that this device is highly susceptible to electrical interference. This adds considerable weight to the hypothesis that the abrupt heart rate increases in the Havas study were actually caused by electrical interference. We contacted the manufacturer of the Nerve Express, who confirmed that the "spikes" in the graph were artifacts, and not true changes in heart rate. In addition, we contacted a professional cardiologist, who also confirmed that such "spikes" are not physiologically possible. Either hypothesis 2 or 3 are the likely true explanation for erratic heart rate measurements. The supposed electrohypersensitivity of the subjects cannot explain the physiologically impossible abrupt changes in apparent heart rate.